Wireless hotspots are springing up in buildings and homes all over the world but one New York artist has literally taken the idea onto the streets, turning his bicycle into a wi-fi hub. Yury Gitman describes himself as a wireless and emerging-media artist and for his latest project has turned to cycle power to create the wireless bike. It has been capturing the imagination of New York's trendiest urbanites and has been described by one New York paper as one of the hippest hotspots in the city. "As well as being cool and stylish, it is also mobile," said Mr Gitman. The wireless bike, or Magicbike as Mr Gitman prefers to call it, is not just a trendy alternative to the wi-fi cafe or office. It can fulfil an important function in bringing internet connectivity to areas ignored by the traditional telecommunications industry. "A grassroots bottom-up wireless infrastructure can be formed and pedalled to any place accessible by bicycle," said Mr Gitman. In a wired city such as New York, he envisages it being used at art and cultural events, public demonstrations and for emergency access. In communities at the fringe of internet connectivity it could become a more permanent lifeline. 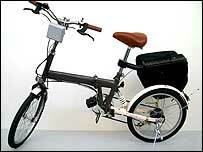 The wireless bike has wi-fi antennas which mounted on the bike's frame and feed into a laptop hidden in the saddle-bag. The connection is received either from the cellular network or from nearby hotspots. Mr Gitman admits that borrowing bandwidth from nearby open networks is something of a legal grey area. "There is not a one world legal answer but it is arguable that it is sometimes illegal," he said. There is however plenty of bandwidth to go around and Mr Gitman believes that hotspot owners will not be aware of the bike sharing the signal unless large video files were being downloaded. The idea has proved popular and Mr Gitman receives hundreds of e-mails to his Magicbike website from people interested in setting up similar ideas. Mr Gitman is considering setting up a community based website for wireless bikes as they spring up in other cities and countries. The closest he thinks the idea has come to being commercially available is a similar idea used on bike taxis in the Danish capital of Copenhagen.